I used the 70-300mm lens on my Nikon d40 camera. 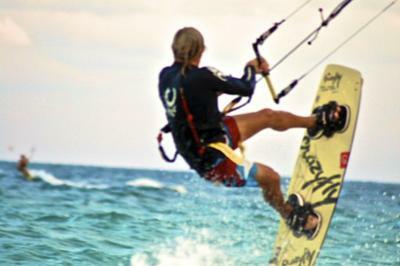 This picture is just a picture of a kiteboarder doing a trick. This guy is crazy he just had two broken ribs and now hes back out there. Note from Jonnie: ISO is the film setting. For digital cameras, it relates to the comparable setting of your image sensor. If you are going to use a faster shutter speed, you may have to use a faster (higher) film (ISO) setting. For more on this, please check out these articles on the SLR Camera.